Calling all seafood lovers! Ok so your not substitute chicken then but sauteed in butter! This is a seafood lovers dream meal! 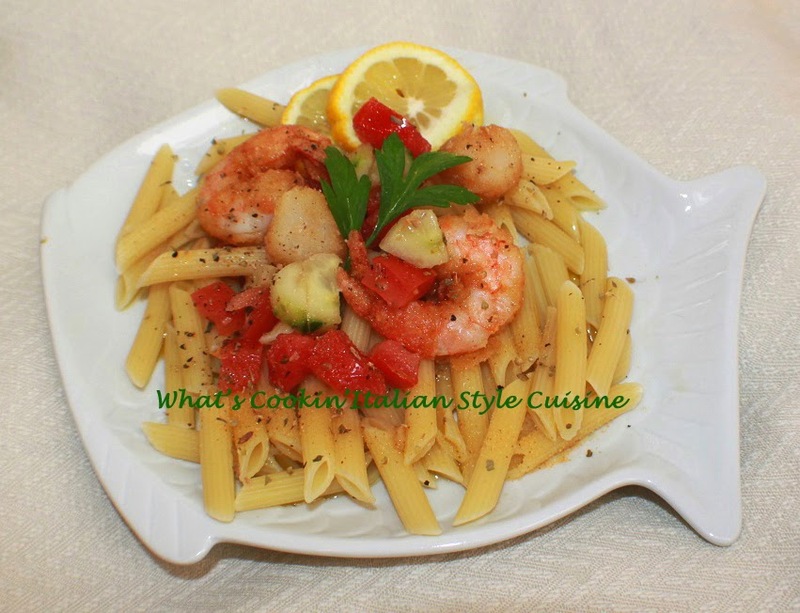 Seriously the best tasting scampi that fresh and delicious with your favorite pasta. I chose penne pasta this time but have made this with fusilli, vermicelli, rigatoni and cavatelli. Your the judge of the pasta, it doesn't matter as long as it's hearty enough to absorb the amazing scampi sauce your about to make! Let's get start shall we? Cut zucchini and tomatoes into small chunks. Combine zucchini, tomatoes, wine, 2 tablespoons olive oil, seasonings such as herbs, 1/4 teaspoon salt, and 1/8 teaspoon pepper ( I like a little heat so I add a pinch of cayenne pepper too). Arrange in an even layer in 13- x 9-inch baking pan; pour remaining oil mixture over vegetables. For softer vegetables, place in the oven for around 15 minutes on 400 degrees. Otherwise proceed below, they will be a little crisp. Combine scallops and shrimps with 3 tablespoons olive oil, 1/4 teaspoon salt, and 1/8 teaspoon pepper or more to taste. Arrange scallops and shrimps on top of vegetables. Broil 8–10 minutes or just until scallops are opaque and firm, shrimps turn pink and begin to brown on top, take out the scallops if they cook quick then the shrimps, remember if you happen to use frozen to thaw them first in the refrigerator. Heat olive oil and butter in a fry pan, add garlic for 1 minute do not brown. Add everything but the parsley and zest, boil for 30 seconds. Add the parsley and zest last. Add scampi sauce then toss to coat vegetables and pasta and scallops on top, add the salt and pepper to taste, serve immediately. I also like to top mine with buttered bread crumbs which is another option. Just add butter to a fry pan around 2 tablespoons, add some Italian flavored bread crumbs and fry until browned. Sprinkle on top, delicious! I hope all is well my dear. I love scampi, Claudia, and your recipe sounds amazing! Pinning!